Sofritas. Spicy, savory, healthy, delicious sofritas. I’m kind of addicted. This recipe has all of the requirements that an athlete in training would demand for dinner. 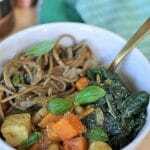 It has protein, good carbs, veggies, flavor, spice (for endorphins), and it’s GOOD! Like really, really good! These tasty wraps also have all of the requirements that busy people demand. They’re easy to make, fast, and they’re a crowd pleaser. 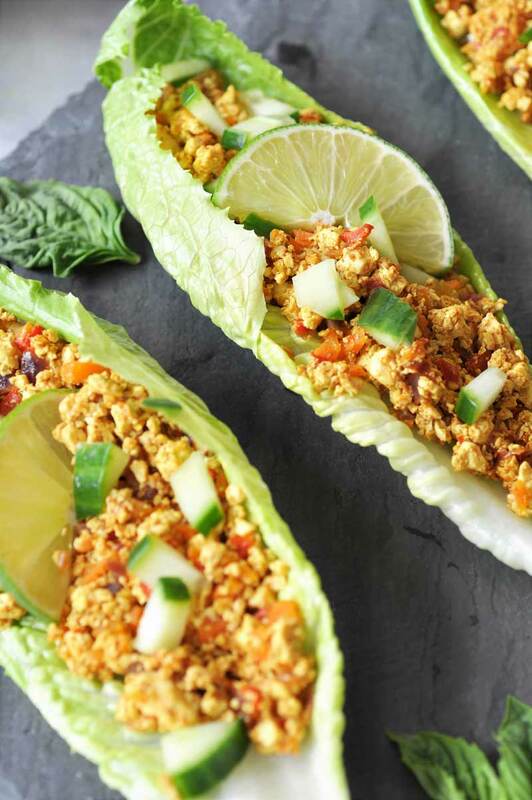 It’s safe to say that these sofritas tofu lettuce wraps are for everyone and anyone who’s looking for a healthy dinner that’s done in less than thirty minutes, won’t break the bank, and will nourish your body and your taste buds. As spring weather slooooowwwwllllyyyy pushes its way toward Chicago—yay you if you live in a nice climate—my brain and my body are craving lighter, more colorful, and healthier food. How about you? Are you thinking about foods that will make you rock your shorts this summer? Who doesn’t want to rock their shorts? We all do. That’s why we all need to start putting away the heavy winter comfort food and start embracing lighter fare. However, that doesn’t mean that we have to deprive ourselves of flavor, or eat less. Not at all! That’s the beauty of a whole food plant-based diet, we GET to eat when we’re hungry! 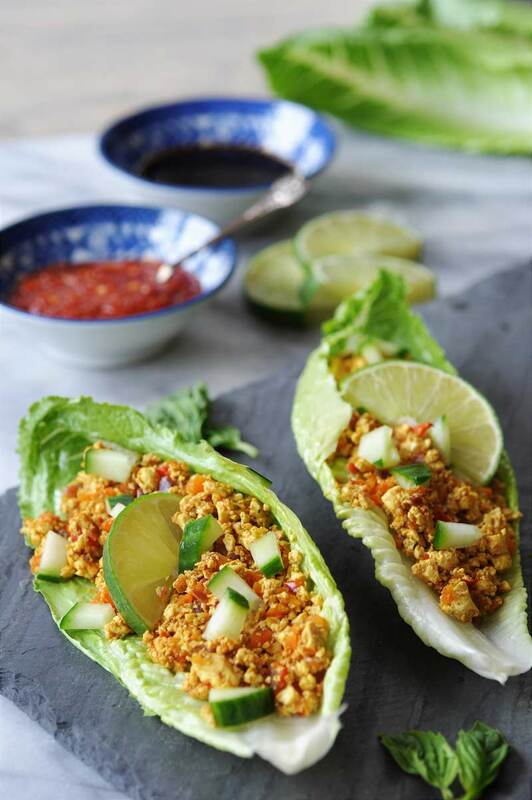 These spicy and filling (lighter food doesn’t mean that you need to starve) sofritas tofu lettuce wraps are my kind of spring/summer food. They don’t take a lot of time to make, they tick all of the nutritional boxes that I’m going to need as I train for the Chicago Marathon in October, and several half-marathons this summer, and they’re delicious and nutritious. 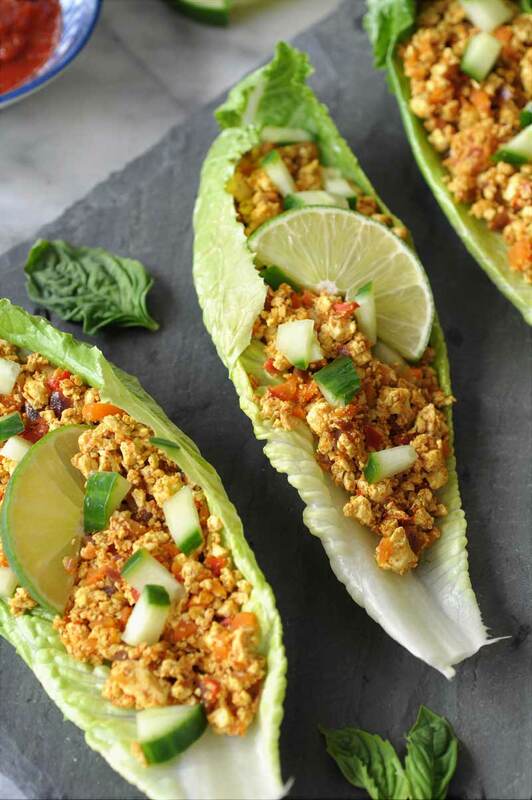 All you’ll need to make these is super firm tofu, a few carrots, a bell pepper, a red onion, garlic, spices, teriyaki sauce, lime, and lettuce. You’ll also want chili sauce and/or soy sauce to drizzle over them if that’s your thing. It’s my thing. If you have a large iron skillet or a large non-stick skillet you’re golden. This recipe requires a big pan. Heat some avocado oil, or vegetable broth if you don’t cook with oil, add the carrots, bell pepper, and onion, and cook for approximately ten to fifteen minutes. The carrots and peppers should be soft, not too crunchy. When the veggies are cooked properly, add the garlic and the tofu. Use a potato masher to smash the tofu until it looks like small crumbles. Add the spices, teriyaki sauce, and lime juice. Stir and cook for about ten minutes or until the tofu loses most of its moisture. Fill the lettuce leaves with the sofritas mixture, sprinkle some fresh cucumber on top, and drizzle with soy sauce and/or chili sauce. You can totally pig out on this and not feel one bit guilty. There’s nothing in it that will weigh you down. 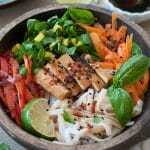 It’s safe to say that this sofritas tofu lettuce wraps recipe is shorts and swim suit friendly. You’re welcome. Have you ever had sofritas? Do you love lettuce wraps as much as I do? A spicy tofu sofritas wrapped up in fresh lettuce leaves. The perfect light and delicious meal for a busy weeknight. Put the tofu on a plate lined with paper towels and put a layer of paper towels on top of the tofu. Put a heavy pan or bowl on top and press the extra water out of the tofu. Change the paper towels if necessary. Heat the oil or vegetable broth in a large iron skillet or non-stick pan on medium heat. When the oil is hot add the carrots, bell pepper, and red onion. Stir well to combine and cook for ten to fifteen minutes or until they’re soft. Add the garlic and tofu and use a potato masher to break the tofu down into crumbles. Add the turmeric, cumin, coriander, ginger, chili powder, chili flakes (optional), teriyaki sauce, and lime juice and stir well. Salt to taste. Cook the sofritas mixture for fifteen minutes or until the water has cooked out of the tofu and it has a dry texture. Let cool to slightly warm and spoon into lettuce leave and top with fresh cucumber. Squeeze more lime juice on top if desired. You can spoon chili sauce and/or soy sauce on top if desired. Gah, I forgot all about shorts....I'm craving the ability to start wearing dresses again! My favorite thing! I'm starting to lose hope here :/ It snowed again on Saturday!! And no...I've never had a sofrita vegan or otherwise :( Must fix that! 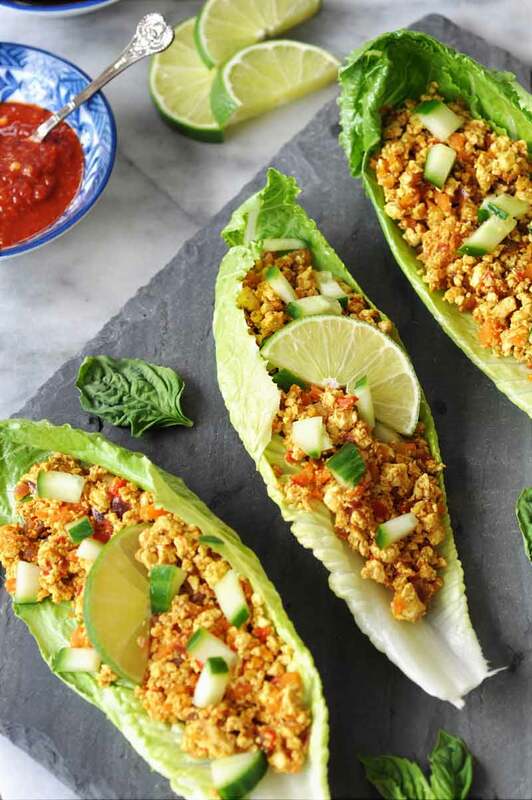 I do love lettuce wraps as much as you do <3 They are romaine at it's very best! I've never had them with a spicy mexican filling, but I'm impinging that to be amazing. Crunchy watery lettuce next to spicy sofritas filling, yep sounds perfect! Oh wow! I love sofritas and love the idea of lettuce wraps instead of tacos! I LOVE sofritas!! So so good! Your recipe looks super easy and I have everything on hand! And YAY for sunshine and warmer weather this week! Amen to the sunshine and warmer temps! I can't take the cold for one more minute. Thanks, Jenn! 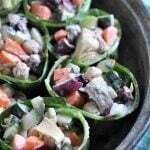 I had something similar this morning in a tortilla, but what a great idea to use lettuce cups instead to keep things light and add more fresh vegetables to the mix. That's awesome that you're going to run the Chicago marathon! I'd eat this in a tortilla too. I'm just trying to lighten things up around here so I opted for lettuce leaves. :) Thanks, Cadry. I'm getting nervous about it. I'm so sorry to hear about you all still having snow :( but at least it gives you a little longer to get ready for "shorts season". :) The first time that I had sofritas was actually at chipotle about a year ago, and I didn't love it but now, I may just have to take another "go" at it using this recipe. Hahaha! There's the silver lining. :) Chipotle's sofritas are okay, just a bit too salty for my taste. This recipe is much fresher, and healthier. Thanks, Nicole! LOVE!!! I actually like the sofritas, I go light and mix them with so many other things so it cuts the saltiness out. But I love the spice! I make a similar concoction but never write down what I put in it. LOL I will have to try your version! Looks amazing! My version isn't as salty or as spicy as Chipotle's, I didn't want to knock my readers out-haha! I add a lot more fire to mine. Thanks, Sophia! Thanks, Rachelle! I just got the "congratulations, you're in" email from the Chicago Marathon, and now I'm terrified! Holy crap, things are about to get real. So sorry about the weather, so strange lately! Shorts weather is coming soon! This looks perfect for a bright and refreshing warm weather meal, thanks! Thanks, Christine. It's supposed to be in the 60s by the end of the week, so I'm hanging tough and doing some heavy spring cleaning indoors until then. The weather is starting to get nice here in England, the sun shines one day and the rain pours the next. But hey, it's an improvement from 24/7 rain! Anyway, I love how healthy yet how delicious these sound. YUM! When Alex studied abroad in London she loved the weather. She said it was never too cold or too warm. I don't think there was one thing that she didn't love about England. :) Thanks, Aimee! Alex studied abroad in London and she loved the weather. Actually, she loved everything about England. Thanks, Aimee. Ah I love lettuce wraps! 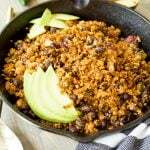 My kids and I had so much fun making this recipe too, and the hubby loved it. Added crushed peanuts, mint, and green onions. Will definitely be making it again. i have yet to try sofritas at home...sending you sunshine from Texas! Wonderful ingredients! Totally in to this. :) lovely Linda! I've never had sofritas, but love lettuce wraps. It's a gluten free girl's best friend. Love your recipe! 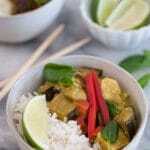 This looks so delicious, I am putting this down in my dinner menu plan to make this soon! Cute! They really do look like canoes. :) Thanks, Alissa. These look so healthy and delicious. Love that you used lettuce instead of taco shells. So much better! I love lettuce wraps. They're always my top choice over tortillas. Thanks, Vanessa! I just realized it has been too long since I had tofu. Adding this to the list of all the things I want to make in the new place! The perfect breakfast! I love savory so much more than sweet. YUM! These look soooooo good and full of all my favorite flavors and spices! I love that you put them in lettuce wraps too. These are healthy and delicious...could eat 5 of them I bet easily! Who needs Chipotle when you can make this at home? Looks delicious. This isn't quite as spicy as Chipotle's sofritas, but you can always add more heat. Thanks, Sina! Made these last night.. delish! I used them as a taco salad type topping instead of using the lettuce wraps, but same principle, right? Will definitely make again.